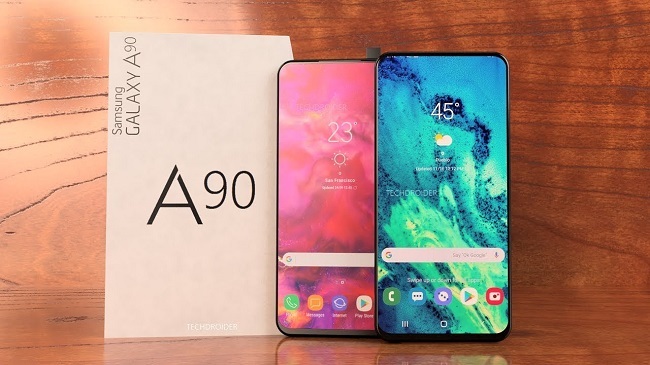 Samsung is all set to launch its next mid-budget smartphone Samsung Galaxy A90 in India. The smartphone is in leaks from past few months and comes with great specifications and features. According to leaks , the device will be powered by Snapdragon 7150 SoC and will run on Android 9.0 out of the box. It may also get in-display fingerprint sensor and sliding camera as well. The smartphone will come with a 6.41 inches of OLED display which will have a full bezel-less finish and a small front camera sensor popping out from top. Samsung Galaxy A90 will be the first smartphone to feature sliding camera support. The expected launch date of Galaxy A90 is April 10, 2019.